For every little boy who’s dreamed of becoming a policeman or fireman, there’s a little girl who wants to be a ballerina. My theory is, in many instances, they just like the clothes. Fortunately for my three girls, Grandma had a closet filled with recital costumes, prom dresses, hats, high heels and gloves. What a time they had (my mother included) pulling everything out, listening to stories of who wore this or that, and parading up and back as they modeled for an ever-present audience…the camera. 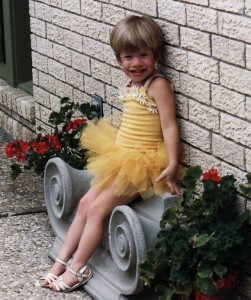 Becky was the smallest of the granddaughters, and the only cousin who could fit into my sister’s old ballerina costume – the daisy-studded one with a yellow tutu skirt. Somehow the sandals didn’t do the outfit justice, but all the same…when the straps slipped over Becky’s shoulders, she WAS a ballerina. I wonder what visions danced in her head as she dizzily twisted and twirled in circles so her tutu could fly with the wind! When she worked in the kids’ department at Nordstrom, she told little girls that every dress needs to pass the “twirl test” to make sure it’s just right. Prayer: Heavenly Father, help me arm my children with the knowledge of the character of Christ so they test and make their decisions based upon what they believe He would do. In Jesus’ Name, Amen.